‘“The Call is an important and magnificent event for us, the Heaters, the people of fire country. It is near and dear to my heart. It is a chance to say to all that threaten us, we will not be defeated! We will carry on, replenish our flock! We are not afraid!” A cheer rises up, but it’s deep and heavy— a man’s cheer. When I look ’round most of the women are silent.’ (Kindle Locations 3710-3712). Siena will turn 16 shortly and her world will change. At seven her body could reproduce. At 16 she will be matched with her Call and produce a baby. At 19 and 22 she will be re-matched and reproduce twice more. At 32 she will probably die. That is the life for a girl in the Heater Tribe out in Fire Country. As a Pre-Bearer, Sie’s life is mapped out, but what if she has a choice? Her friend Lara knows something. Sie doesn’t want to have to break off her friendship with Circ to be a Call, to do her duty. When the time comes to make a decision, what will Siena choose? She doesn’t know the complete truth, but she will try her hardest to find the answers to the ever-increasing questions surrounding the Heaters and her father, the Head Greynote. Siena is Scrawny and Circ is Smoky and together they are the best of friends. Sie lives for Circ and will do anything, even something completely stupid, to try to save her friend. She can’t imagine what life will be like after the Call, when she’s been matched with another random Heater in order to bear children and keep the Heater tribe alive. She can’t imagine it and it never enters the readers mind that it is a real possibility. Something has to happen. Her life and the story would be over if she was the obedient daughter who followed all the rules. Siena is not one to follow rules without question. She is always seeking out the truth. She may be the scrawniest in the village, but she is tough where it counts. She is brave when it counts. She doesn’t think of only herself when those she loves are in danger. She is a character that fights, that doesn’t back down, that can take a hit. She is a true heroine. Yet, she still gets battered and bruised. She is still knocked around by her father, the town bullies, and her own two left feet. She is far from perfect, but she is someone to look up to nonetheless. The intense friendship between Siena and Circ blossoms just like the romance between Adele and Tristan in the Dweller Saga. David Estes has a way of bringing two people together and showing their intense feelings and love for each other. There is nothing in Sie’s way in her love for Circ, except her realization that Circ is more than just a friend for her. If it were possible, she might choose him as her Call. Society and her father have other plans, though, and in the Heater world Sie and Circ can never and would never be matched. 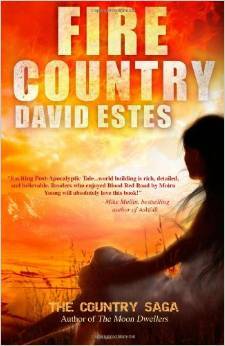 I absolutely loved this first novel and will be consuming the entire Country Saga series by David Estes for more daring heroines, dashing heroes, sinister leaders, engaging love and friendships, and everything that Estes is able to do in his books that is so very captivating. This novel was published by David Estes 01/23/2013 and is available on Amazon here.